The Optech Series is one in a long line of firsts from Tohickon. 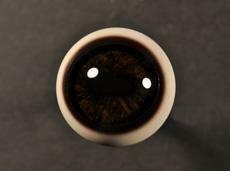 This was the first production glass eye made with an external white sclera and brown limbus band. Still a standard in the industry it has been copied, but never truly duplicated. Our Optech series is still painstakingly hand painted by our talented artisans using the finest materials and a perfect blend of modern tools and old world techniques. Available in a wide range of colors and sizes.